Mohammed Morsi 20-year sentence: Former Egypt president charged with killing protesters. 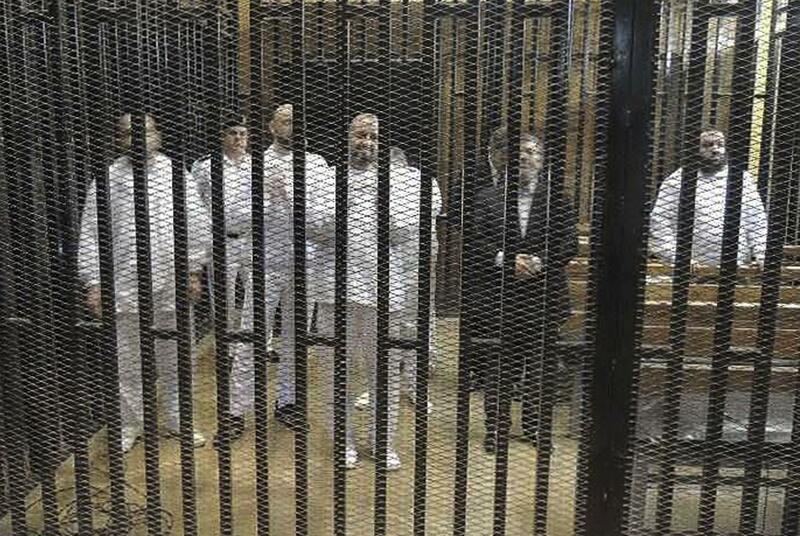 Mohammed Morsi, second from right, with with other Muslim Brotherhood figures in a courthouse during his 2013 trial. The case stems from violence outside the presidential palace in December 2012. Morsi’s supporters attacked opposition protesters demanding that Morsi call off a referendum on an Islamist-drafted constitution. Clashes developed into deadly confrontations overnight that killed at least 10 people. As the verdicts were read, the defendants shouted, but their words could not be heard because of the thick panes of glass installed after a defiant Morsi declared himself the rightful president during earlier sessions.